Tynemouth is a beautiful coastal town on the north banks of the River Tyne in North Tyneside. Less than 10 miles from where we live in Newcastle-upon-Tyne, it is also less than ten stops on the Metro. Tynemouth has been named as the best place to live in the North, according to the Sunday Times, and this once sleepy seaside resort has charmed its way to the top with its elegant Victorian architecture, sweeping beaches, craggy cliffs with a vibrant cafe culture. It’s popular with surfers, hipsters but would it be popular with tweens? We headed to our local Metro Station in Byker to travel to Tynemouth by Metro one Sunday to find out. Even when I lived near Consett as a teenager we used to travel to the coast, first by bus into Marlborough Crescent bus station, and then by Metro from St. James or Monument to the coast. It used to cost 10p as a child. 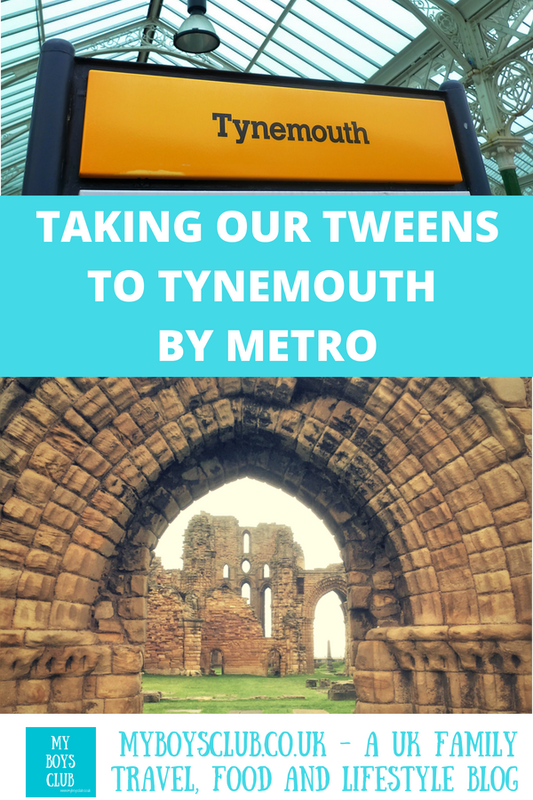 It was so convenient, quick and easy and I loved going to the coast by train with my friends, so we decided to take our tweens to Tynemouth by Metro too. It’s a 10-minute walk to our nearest Metro Station – Byker and from there just 9 nine stops to Tynemouth. It takes less than 20 minutes to travel there and the trains run regularly, every 15 minutes on a Sunday after 10am and even more frequently during the week. I bought two over 18s POP PAYG cards for me and hubby to use on the Metro. Pop cards are available free online but must be topped up at the time of purchase with £10 which you can then use to pay your fares on the Metro meaning you don’t need to have cash on you or indeed queue at the ticket machines as you simply swipe the orange ticket reader as you enter and depart the station. The clever technology then works out the cheapest fare for you and deducts it off your card. It really was as simple as that. There is also a daily cap of £4.70 which means no matter how many journeys you make you’ll never pay more than that per day. Pop PAYG is cheaper than adult Single and Day tickets. In fact, it’s 30p cheaper than cash single tickets and 40p cheaper than cash Day tickets. You can travel as many times as you like in a day, and you’ll never pay more than the daily cap (£2.60 for one zone, £3.70 for two zones, or £4.70 for all zones). And with an under 16 POP card travel on the Tyne and Wear Metro costs just 60p. For the boys, as they already have under 16s POP cards we just bought tickets on the day. These costs £5 and include a photograph, and I think I bought mine at the Haymarket Bus Station a couple of years ago. They last a few years and mean they can travel on buses for £1.10 per day and a Metro Child Saver ticket is £1.30. And with a POP card, a single ticket is just 60p – which you purchase by touching your Under 16 Pop card onto the orange reader on the Metro ticket machine to buy a concessionary ticket. There is also a POP card available for those aged 16-18. It’s impossible to miss Tynemouth Market as it is located within Tynemouth Rail Station on the Tyne and Wear Metro Network. Every weekend as you alight from the Metro you are immediately immersed in amazing stalls. There are over 150 stalls to browse around with everything from toys, paintings, crafts, sweets to hats and books. There are food stalls too. The boys could have spent hours and all of their pocket money at the toy stalls and also the sweet stall – bags of sweets for 50p were a firm favourite. The Market covers both platforms in the station which has been restored to the former glory of its grand Victorian days. It is a magnificent historic building and the glazed roof offers shelter whatever the British weather brings, rain or shine! It is open every Saturday and Sunday from 9am to 4pm and offers a great place to explore for parents and tweens, you could easily spend a couple of hours browsing the stalls and tasting the food. Once we’d had a good look around we headed into Tynemouth itself and along to the main street. 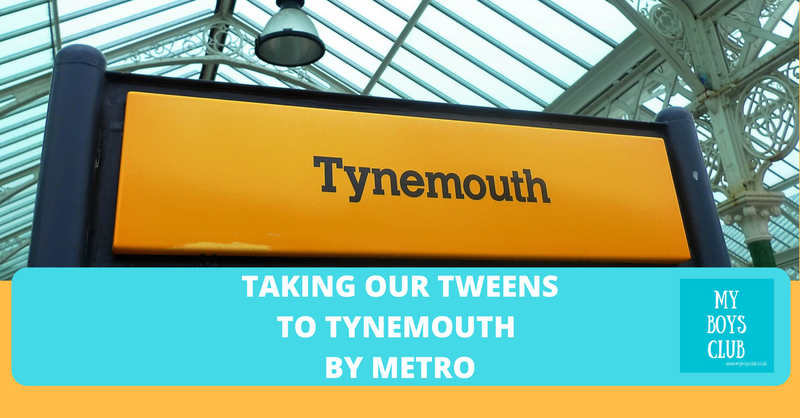 Where to shop with Tweens in Tynemouth? The first place we came to was the Land of Green Ginger, which I was amazed to discover is actually famous for its involvement with the cult TV series, Super Gran. The shopping arcade in a 150-year-old converted church, is located right in the heart of historic Tynemouth, on route to the world-famous Tynemouth Priory and is surrounded by restaurants, shops and bars. Green Ginger is an independent shopping arcade, filled with local businesses catering to your every need from Pet supplies to haircuts, tattoos to design-led or Celtic gift ideas, it also has an Art Gallery, Cafe and selection of sweet and chocolate shops, plus some wonderful clothing retailers, a beauty salon and craft shop. If the boys hadn’t just filled their pockets with sweets bought at the market they would have here. They have earmarked it for a future visit! Where to eat with Tweens in Tynemouth? There are many places to eat in Tynemouth from café and bars to award-winning restaurants and takeaways – there is even a fish shack on the beach that we’ve been to before. However, on this occasion, we plumped for one of our favourite takeaways, Marshalls Fish & Chip shop – aka The Fryery by the Priory. There is usually a long queue, but on this day we struck lucky and were served in just a few minutes. 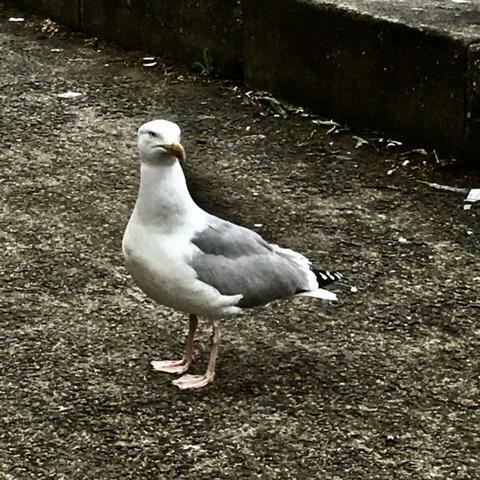 you can opt to sit-in, however, is there anything better than eating fish and chips at the coast looking out to sea! They were very helpful, splitting an adult portion, between two boxes for the boys, making it so much easier to eat them outdoors. It had been raining earlier in the day but was brightening up, so we headed to a seating area overlooking King Edwards Bay to enjoy out chips. There were a lot of seagulls but none came to close and we had magnificent views over to the Priory which we would go and visit next. Tynemouth Castle and Priory is an English Heritage property, on the coast in Tynemouth and was once one of the largest fortified areas in England. We have (affiliate link) an annual family pass for English Heritage so that meant our visit had already been paid for. Overlooking the North Sea and the River Tyne, the Priory dominates the headland. With its 2000 year history and beautiful views, it is the perfect location for a family fun day out, even on a grey day like we encountered. The boys loved running around the grassy areas and playing hide and seek – so many great places to hide. 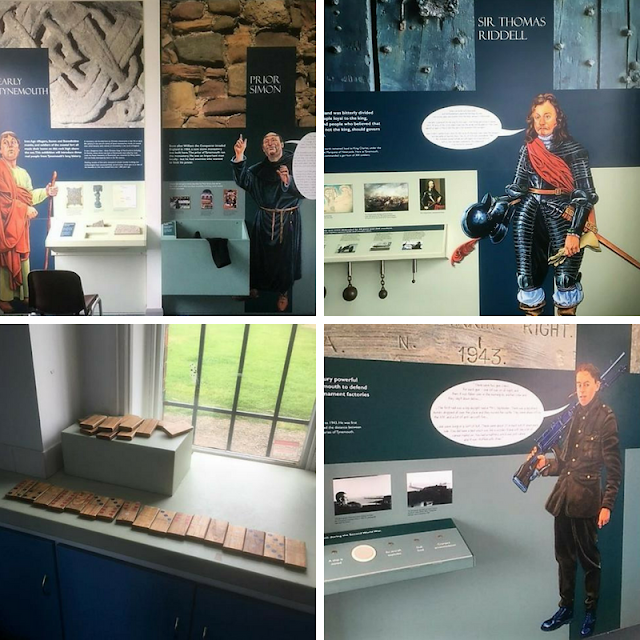 It also has a shop, toilets and a small visitor centre where you can discover all about the history of the site from its original beginnings as an Anglo-Saxon settlement, an Anglican monastery, a royal castle, artillery fort and a coastal defence. The gun battery built underground into the cliffs was designed to defend the Tyne in the First and Second World Wars. The Priory being on the headland also offers amazing views over the historic coastal areas including Tynemouth and South Shields Piers, the Spanish Battery and the Collingwood Monument. Tynemouth Pier is a massive stone breakwater extends from the foot of the Priory some 900 yards (810 metres) out to sea, protecting the northern flank of the mouth of the Tyne. It has a broad walkway on top leading to a lighthouse. The Spanish Battery promontory dominates the river mouth - most of the guns had been removed by 1905 but it is now a popular vantage point for watching ships sail by and almost always has an ice-cream van somewhere nearby. The 7m tall Collingwood Monument has a commanding position at the mouth of the Tyne and is a giant memorial to Lord Collingwood, Nelson's second-in-command at Trafalgar, who completed the victory after Nelson was killed. My boys, and especially my eldest love history. They love discovering new things about their surroundings and as well as the priory on the way back to the Metro Station we discovered two historic houses. The first the Martineau Guest House, named after Harriet Martineau, who lived in the 18th century property for five years from 1840. Living from 1802 to 1877 she has been described as Britain’s first female journalist, the first professional ‘woman of letters’, and the founder of the modern discipline we call sociology. The second a place where Guiseppe Garibaldi stayed in 1854. Garibaldi was an Italian general, politician and nationalist and is considered one of the greatest generals of modern times. Go surfing - Tynemouth Surf Co was established in 1995 and has become one of the leading surf shops in the North East. Situated on the Seafront above the award-winning Tynemouth Longsands Beach, surf lessons are offered Saturdays and Sundays throughout the year. Blue Reef Aquarium – Here you can enjoy close encounters with incredible creatures from around the world at the award-winning Blue Reef Aquarium in Tynemouth. Longsands Beach – The number one thing to do in Tynemouth on TripAdvisor, this beautiful stretch of beach is perfect for sandcastles, surfing, picnicking and walking. It features in our 8 favourite family walks along the north east coast too. Tynemouth Park – With a boating lake, traditional play area, crazy golf, maze and outdoor giant bouncy castles we’ve had lots of fun in Tynemouth park in the past. Pirate Quest is £2 per person plus £1 treasure map (includes prize) – weather permitting it is open 10am until 5pm. The Lost World Adventure Golf is 9 holes £3 for adults and £2 for children, 18 holes £4.50 for adults and £3 for children. They also offer family discounts and weather permitting is open 10am until 5pm. Jungle Wipeout is open 10am - 5pm and is £3.50 for those aged up to 4 and £5 for ages 5-14 for unlimited time on the inflatables. Where is your favourite place in Tynemouth? Disclosure: This is a sponsored post by Tyne and Wear Metro. We received complimentary travel, although we did purchase the tickets ourselves so we could fully review the transport option, and we received compensation for our time. All words and images are our own as well as our opinions! It was really good. And a really good day even though it wasn't 'beach' weather - still plenty to do.